Our patients have told us that our chiropractic adjusts feel better, less scary, and the adjustment last longer than most chiropractic adjustments by others when we switched to adjusting with an Arthrostim (a pulsing activator). Most of our chiropractic adjustments are with Applied Kinesiology & an instrument adjusting tool called an Arthrostim, but we also can use manual, activator, and other types of chiropractic adjustments. Below is a video showing how gentle all our chiropractors adjust. 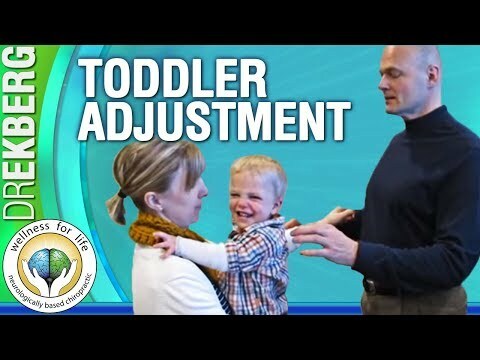 Video: 18-month-old toddler is getting a chiropractic adjustment by Dr. Sten Ekberg. Your body sends messages to the brain from millions of receptors all over your body & the brain sends information back via electrical signals on how to react. Chiropractors lucked out because most receptors are on your back and neck. At our office we adjust from head to toe because your brain needs information about the whole body, & sometimes the place that hurts is not where the body / brain has communication issues (subluxation). What is Neurologically Based Chiropractic? Your brain controls everything in your body! Cutting edge science proves via EEG brain scans that the adjustment stimulates & affects the brain & nervous system. We focus on helping the brain & body be the healthiest it can be by optimizing your neurological function (brain & body communication). We only order x-rays when we suspect pathology or a fracture, which is less than 1% of our patients. X-rays are a snap shot of where your bones are, and they do not show where the issue is or where to adjust. Radiation is cumulative. Even a small amount of radiation exposure adds up, & our goal is to help you be the healthiest you can be. Read more about why we don't take routine x-rays. Why do I need adjustments if I’m not in pain? It’s important for you to know that pain is the last sign that you are not in top health. Your body also has a natural way of altering your mechanics to avoid pain when an impairment in function is present, which is smart in the short term, but over time it leads to dysfunction (subluxation) & disease. Regular assessments of your brain & nervous system function by a chiropractor can help detect, maintain & prevent dysfunction throughout your body. Can I be too old or too young for an adjustment? No. We have seen patients under a week old and over 85 years old. Chiropractic’s drugless & preventive approach to good health makes it perfect for all ages. We have helped patients with a multitude of conditions including sciatica, TMJ, stress, headaches, sleep issues, diabetes, autoimmune diseases, digestive issues, neck & back pain, numbness, pregnancy pains, fracture pain, auto accidents, & more. No. Since a chiropractic adjustment is a specific force, applied in a specific direction to a specific area, it is virtually impossible to adjust oneself correctly & accurately. Usually when you bend & twist you are popping the joints around the one that needs adjusting. Chiropractic is a non-invasive, drug-free discipline, therefore the risk associated with it are very low. We mostly use a very gentle adjustment that even newborns enjoy, so there is no chance in adverse events happening. Chiropractic has the lowest malpractice rates. Insurance companies are so confident that chiropractic is safe the malpractice rate for chiropractors is around $2,000/year where some medical specialties are paying $250,000/yr & more in premiums. Our adjustments are extremely gentle and do not cause pain, as your chiropractor is specifically trained to deliver gentle and effective care. Minor soreness is possible but rare & usually short lived. Many patients will notice some instant relief following their first adjustment; others will take longer to respond. Various factors will affect initial symptomatic relief, including length & severity of the present concern, along with other comorbid conditions & compliance to recommendations.